Eat. That is on the top of agenda. As an American, eating a bountiful meal with turkey and all the classic dishes and fixings is a yearly tradition. One I would never wish to break for all the goodies in the world because food is wonderful. Spend time with the family. I’m mentally preparing myself. I’m trying not to hide away in my room. I will try to fight my natural hermit state. Try to come up with an awesome holiday themed Twitter name. I need a good holiday pun name. If you have suggestions with “Cee,” hit me up with it. Let me see your pun talents. ;) I have two, but I’ve used it in the past two years, so I want something fresh. What’s the plan for your day? 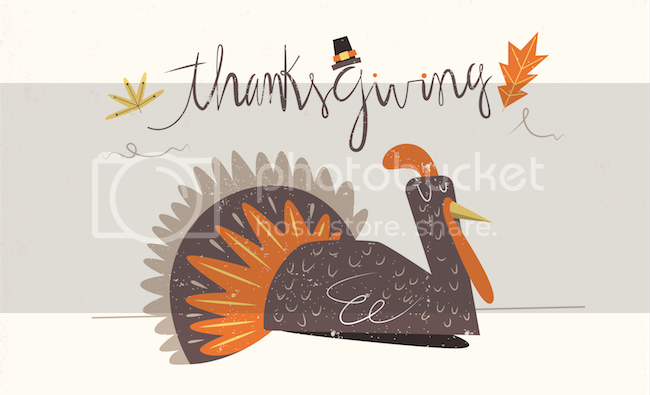 I wish you all a fabulous Turkey day! « 2015 YA Book Cover Choice Awards! · Semi-Final Round! I am so upset that I couldn’t change my Twitter name to “Rosie the Red-Nosed Reindeer” because it was too long. DX I need help with this as well! Nothing sounds good. WAAAAH. The only thing my mind is currently coming up with for you is “Cee-nta Clause”, but that’s not even very good. Haha. It’s sad that we don’t celebrate Thanksgiving on my country. But I guess we could be thankful anytime and anywhere right? :) Can’t wait to hear the christmas playlist. Happy Thanksgiving, and have a lovely day! Happy Thanksgiving :) It is fun when people change their Twitter names. I can’t come up with a good one though.